If you are wondering if can make frozen hamburgers in the air fryer, the answer is YES! And to be honest, they are even more delicious than grilled hamburgers. 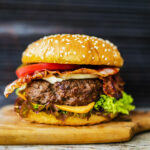 A moist and delicious hamburger made in the air fryer! Although, I found this out by accident. Late last summer I had planned on having hamburgers for dinner. We have a wonderful outdoor grill and this was the way that I always made frozen hamburgers. All I had to do was pre-heat the grill and once it got nice and hot I would add the frozen patties. About 10 minutes later, I would check to see if I could flip them without falling apart. I would open the lid and stand over the hot grill while I attempted to slide a large spatula underneath each burger. Hamburgers over a hot and flaming grill. If there was any sticking to the grate, I would close the lid and wait a little longer. Eventually they would loosen up and I could flip them. After another 10-15 minutes, I could see that the edges of the meat were beginning to crisp up and watched for flow of red juices from the center turn clear. They were finally ready to eat! However, on this particular day, Mother Nature had different plans. Just when it was about time to start thinking about making dinner, a huge thunderstorm moved our way. I thought I could beat the inclement weather so I ran outside to start the grill. Not more than 5 minutes later, I was stuck in a downpour turning the grill off. 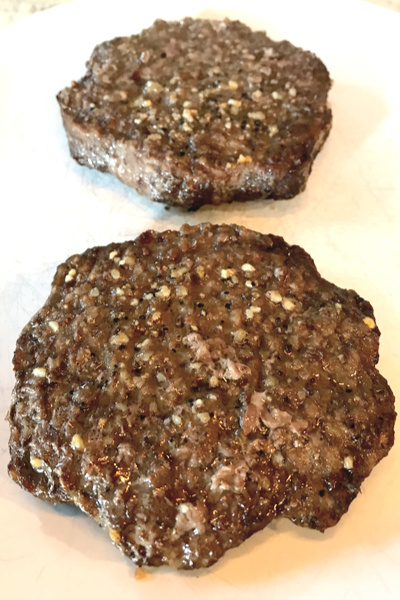 We sprinkle Montreal Steak Seasoning on top of our burgers for more flavor. I first thought about frying the hamburgers in the skillet. However, I didn’t want the entire kitchen smelling like a grill. So I turned to my BCP 5.5 quart Air Fryer to do the job for the hamburgers and my Instant Pot for the Corn on the Cob. 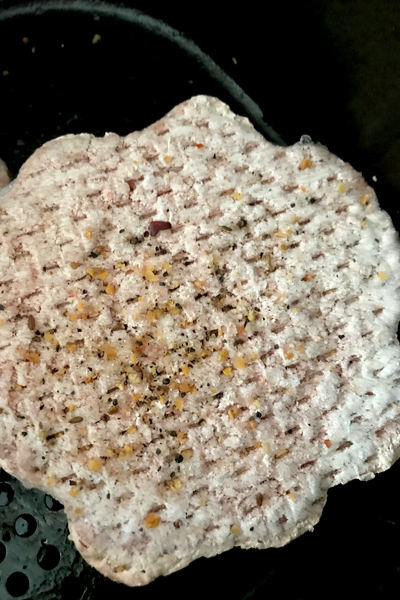 I had never made air fryer frozen hamburgers before, so I wasn’t sure what to expect. I knew that I would have to cook them on high heat to get them to cook properly. After 10 minutes, flip the burgers to finish cooking. So I decided that 380°F would most likely be my best choice. And because hamburgers contain a high content of fat, I decided that that there was need to oil the air fryer basket. I have always cooked my hamburgers from frozen. First of all, I rarely remember to thaw anything. Plus, I purchase hamburgers that are already frozen. That way I can break apart however many I need on a given day to grill. Some days they serve the purpose for a quick lunch for the two of us, and on other days, we may end up cooking a dozen or so for the entire family. Frozen half pound burgers purchased from Gordon Food Service. 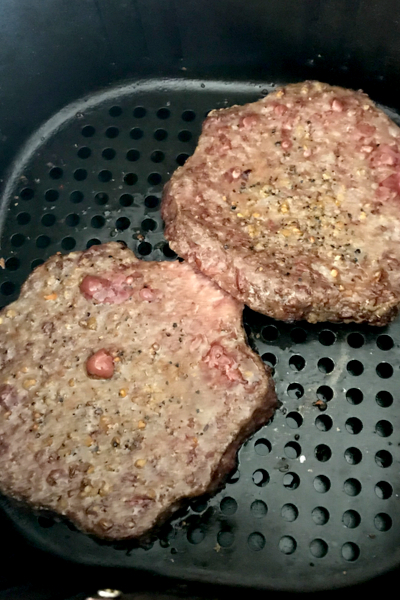 Air Fryer Frozen Hamburgers work best for small batch cooking. Although we have a 5.5 quart air fryer, the basket can only hold 2-3 burgers at a time without overlapping. We purchase extraordinary large burgers. In fact, they are 1/2 pound burgers. Yes, each one of them weighs 1/2 pound prior to cooking. Now those are big burgers! Therefore we can fit 2 of these burgers in our basket. Which is perfect for the two of us! I honestly thought that I was going to just be okay with a hamburger made in the air fryer. Boy was I wrong! I fell in love with them!! 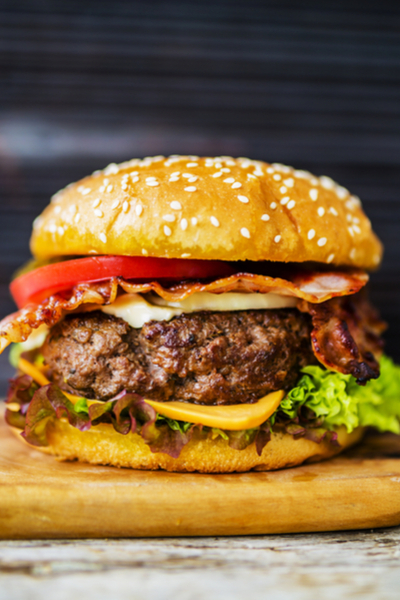 Moist and delicious burgers made in the air fryer! They were perfectly cooked through and were the most moist burger that I had ever had! There were no burnt and dry edges. Each bite from the outside in was perfect! Now I prefer to make frozen burgers in the air fryer! Plus I have now eliminated the need to stand over a hot grill, waiting for the perfect time to flip them. And they get done much quicker and they are much easier to make! For instance, there is no need to run outside to light the grill and wait for it to heat. Hamburger and fries – both made in the air fryer! Just set the air fryer to 10 minutes, add your seasoning (we use Montreal Steak Seasoning), and wait until it beeps. Flip them once and 9 minutes later, you will have the most delicious burger on your plate! Plus, did you know that you can even make a whole chicken in an air fryer? Find our other favorite Air Fryer Recipes Here. 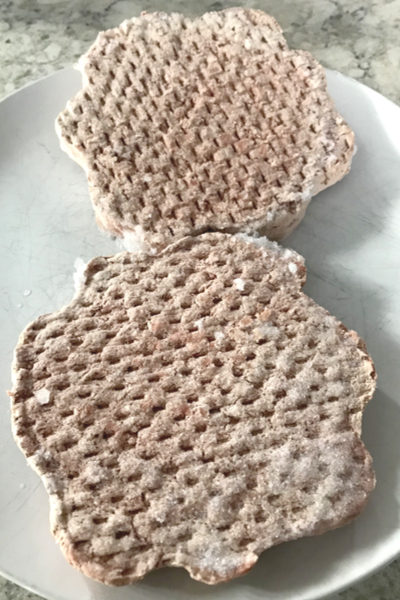 Air Fryer Frozen Hamburgers that are the best and most moist hamburgers that you will ever have! Pre-heat air fryer per your manufactures instructions if needed. Place 2 frozen hamburgers in the basket of your air fryer. Sprinkle with preferred seasoning. Set the temperature to 380°F and cook for 10 minutes. Once the cooking time is up, flip the burgers and cook for an additional 9-10 minutes. 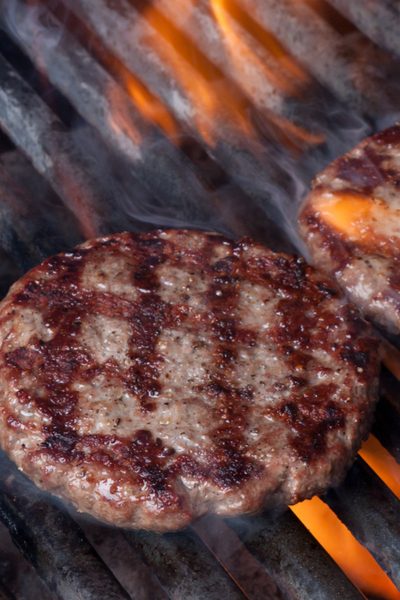 *The hamburgers used for this cooking method were 1/2 pound burgers that were approximately 5 1/2 inches in diameter. 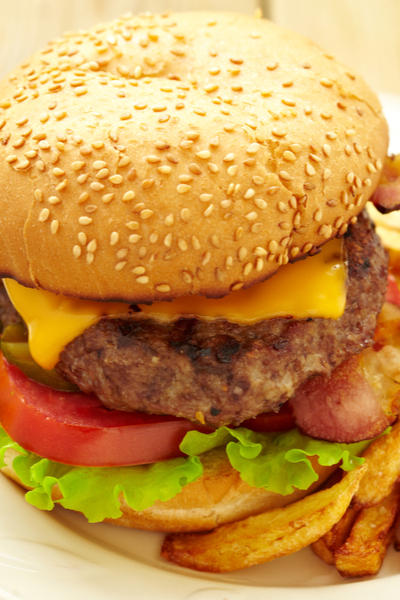 Adjustments of cooking time will be needed for thicker or smaller burgers. All air fryers cook differently. This recipe was tested in a 5.5 quart BCP Air Fryer.